The event will be running on November 10-11, both days will start at 9AM PST/5PM UTC. It will have 128 players competing over a $10K prize-pool and so it should be quite the show. The all-draft event will feature a 7-round Swiss bracket on Saturday. A top 8 single-elimination bracket will decide the winner on Sunday. The tournament will be run entirely through an in-client tournament system which will be available for everyone to use on launch day, November 28th. Also, Valve announced it's going to be run on their Steam.TV streaming service. I'll try to catch some of this demo tournament. 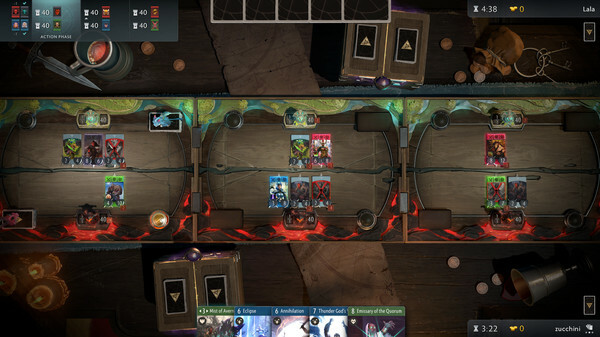 I'm looking forward to another card game for Linux. There are few. Yeah it is rather unfortunate. I only know this because watching the streams you can occasionally get a glimpse of the monitors before the game is launched. That and they accidentally tabbed to the desktop on the streaming machine once. I still think they should use Linux. A lot of mice can have stuff like their DPI saved to their firmware and I can't imagine macros are allowed so I can't think of any other config the players would need outside of the physical hardware itself. The other thing Valve could do is push the players to use Linux on their practice PCs but honestly I don't think the OS should matter that much.